A spud on the dark side. That's how toy maker Hasbro Inc. is promoting its latest Mr. 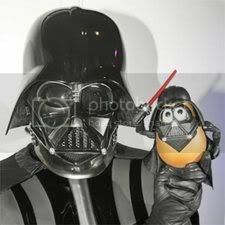 Potato Head figure, Darth Tater. 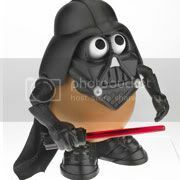 According to Hasbro, Darth Tater will come with a light saber, cape and helmet, in addition to the regular Mr. Potato Head accessories such as eyes, mouth and nose. Thus, you will be able to "have all kinds of mix n' match, Mr. Potato Head fun with this wacky spud dressed as the infamous Star Wars villain, Darth Vader." Was thinking, a Darth Bush figure would be much more fun. haha..